Having seen the HP TouchPad over at the FCC most recently, it shouldn’t surprise anyone to expect to see this one become a reality in the very near future, but when it’s being teased by the nation’s number one consumer electronics retailer, you know that something is surely brewing. Big box retailer Best Buy now has a teaser site live on its web site explaining pretty much all the features and specifications of the upcoming webOS powered tablet. However, two of the most important items regarding the tablet are still unknown – specifically, its pricing and release date. Interestingly enough though, it’s slapped as “coming soon” on their site, which could potentially mean that we could very well be near its launch date. 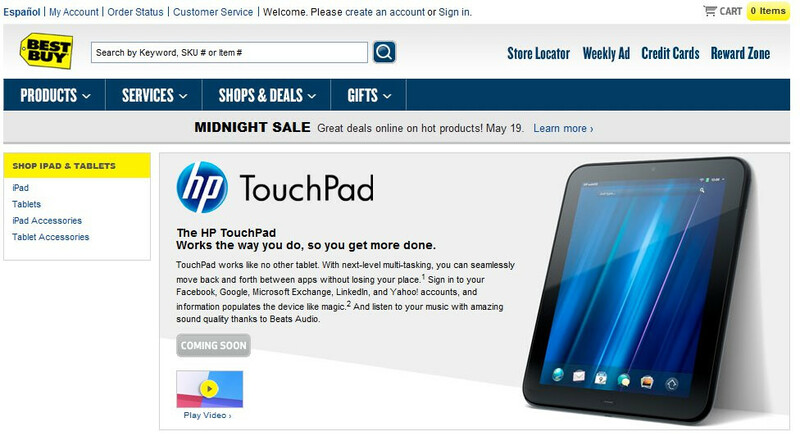 Nonetheless, we can all drool and dream about the HP TouchPad, but of course, you can keep on checking Best Buy’s site to see if any changes or new information pop up regarding its release and pricing. They've announced this product way back in Feb, and up to now, they still don't have a release date. So yes, it's too late. People have already bought the ipad2 or the playbook or xoom or the galaxy tab. 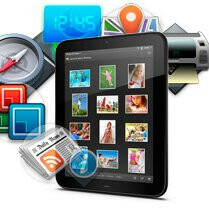 By the time this one comes out, most users interested in owning a tablet have already bought one. I'm waiting for this tablet gemini. Finally a real business tablet. All i seen Before was entertainment systems called ipads, galaxy tabs, Xooms, playbooks ect. I LOVE webOS... but what makes it THAT much different from the Honeycomb Tabs and the iPad? It seems to me HP is much more excited about it's Tablet then it's Smartphones. If they have learned from the mistakes of the Xoom (poor advertising, really high price) and Playbook (released with the immediate need for an update- really, RIM? ), this is a promising device. I just do not know how much of a desire there is for tablets. I am very interested in a tablet that performs like a PC, in that it allows USB hosting so that keyboards, screens and storage can be hooked up to it. I would gladly pay $400 for a tablet that does all my basic college type functions and weighs 4lbs less. And since Web OS will be on all future HP laptops to allow for easier integration and file swapping, I am excited about the potential. If this tab is too heavy, then I will go with one of the other choices coming forth in the android world.